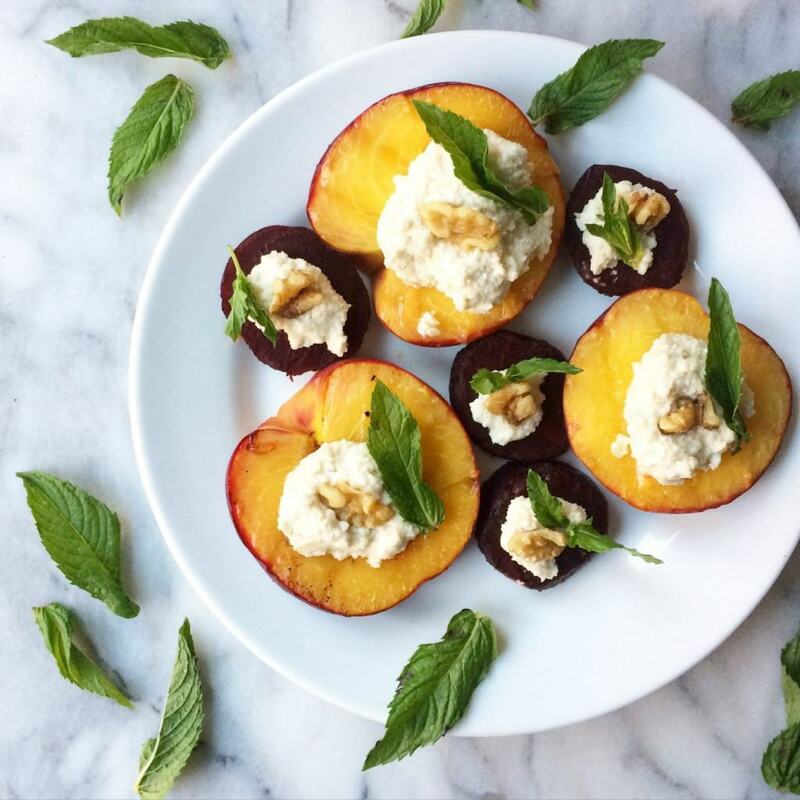 At the intersection of side dishes and desserts is this grilled peaches and beets recipe. It’s subtly sweet, but not so much so that you couldn’t have it with dinner. The ricotta can be dairy or dairy free/vegan, so that this dish is suitable for everyone at the table! I usually don’t post on Saturdays but this simple and flavorful plate of sweet produce merited some extra attention. If you follow me on Instagram, you may have already seen this, and I apologize for the repetition. If you don’t already follow me, and you use Instagram, I highly recommend you do. I mostly post bonus recipe and meal ideas, so if you like every day dinner inspiration, I think you might like my Instagram account. Ok, shameless self promotion over (I didn’t mean it that way, but it certainly came out like SSP). Are you a beet lover or a beet hater? I’m convinced that anyone who doesn’t like beets just hasn’t had them prepared the right way. If you just boil them to death, there’s no way they will be palatable. If I’m being 100% honest, unless I am roasting them, I like to buy them pre-cooked. For roasting, it’s best to start with raw beets. But if you’re grilling them or baking with them, it’s much easier if they are steamed until tender. And, it’s grilling season. I ate a fair number of these beets and peaches straight off of the grill – just the produce, a brush of oil, and a kiss of flame – but if you want to go the extra mile, you can top them with a lemony, honeyed whipped ricotta (vegan or dairy), a crunchy walnut and an herbacious mint leaf. Please forgive my use of the word “herbacious”. I’ve been watching too much Andrew Zimmern. If I promise not to, under any circumstances, use the word mineral-y or barnyard-y, will you forgive me? Roughly chopped walnuts and fresh whole mint leaves for assembly. In a heatproof bowl, cover cashews with boiling water to about 1" above the cashews. Cover with a plate or tinfoil and set side to soak for at least an hour, or as long as overnight. Once they are soft and slightly spongy, drain (reserve the liquid) and transfer nuts to a food processor or high speed blender. Puree with lemon juice, honey or other liquid sweetener, and salt until smooth. Add a splash of the reserved soaking liquid if necessary to keep the nut mixture moving and smooth it out. Set aside. Preheat your grill. Brush or spray the peach and beet slices on each side with oil and place them in a single layer, about 1" apart on the preheated grill. Cook for 2-3 minutes. Once they have softened and grill marks start to appear, flip and grill another 2-3 minutes until grill marks appear on the other side. Remove from the grill and lay out the slices in a single layer on a plate. Top each slice with a dollop of ricotta, a sprinkle of chopped walnuts and a mint leaf. If you would like to use dairy-based ricotta, simply skip the cashews and the soaking, and instead, use a blender or electric mixer to whip together 1-1.5 cups whole milk ricotta with the lemon juice, honey and salt. Feel free to slice the mint leaves into thin strips, if you prefer. Store fully cooled leftovers in an airtight container in the fridge for up to 3 days. It's best to store the components (produce, cheese, nuts, mint) in separate containers and assemble immediately before serving. This recipe was adapted slightly from Love Beets. The beets that I used for this recipe were provided to me by Love Beets, with no obligation to share these recipes. I’m sharing this only because I genuinely enjoyed the recipe and hope that you will too! Grilled peaches have been on my to-do list for a while now, but I usually make mine with balsamic and maple syrup, and serve them with vanilla ice cream. I love that you made this a savory/sweet salad. I can’t wait to try it. Great idea!! Maple and balsamic sounds delicious, especially with the ice cream! I am obsessed with balsamic reduction on just about everything, especially since I started making it at home. By the way, I saw your lovely post on FBP and for some reason it is not letting me respond, but I appreciated the note and can’t wait to check out your site! This looks so good, Nora! I have yet to grill any kind of fruit or try cashew ricotta, but I’m definitely adding this to my list. Oh, you should try the grilled fruit! It’s life changing!! Yummm!! What a lovely summer recipe; your description of the grilled peaches and beets have me practically drooling for some like asap (: Hope you’re having a wonderful weekend! If the description makes you drool, you have to try the dish!! 🙂 Hope you are having a great week! !